A funky statement bali in beautiful shiny silver with a pearl inserted in the centre. You can never go wrong when you buy something so precious! These Turquoise earrings are trendy, fashionable and definitely will make a statement. Just wear these and you're all set for your party! If you liked our Egyptian collection, you will like this one better. These ear cuffs are versatile and funky! The lapis and turquoise stones adds to its beauty. Wear it and you're sure to make a statement! 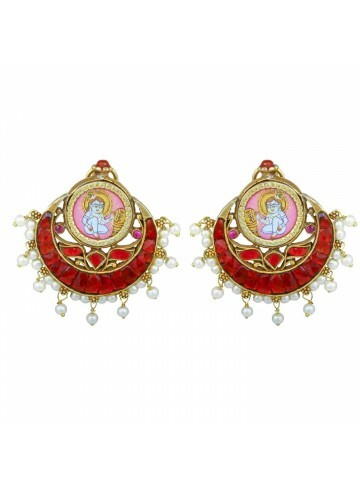 A beautiful pair of statement earrings in multicolor enamel. 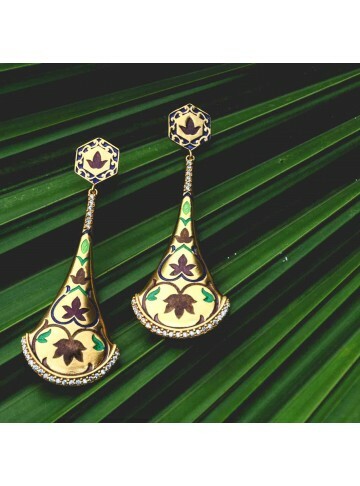 We absolutely love the shape of this earring and the intricately painted lotus design. Perfect to wear this Festive season! 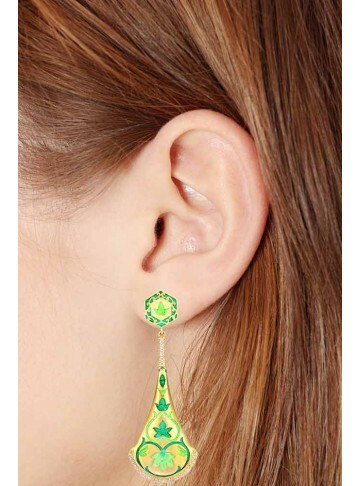 A beautiful pair of statement earrings in green enamel. 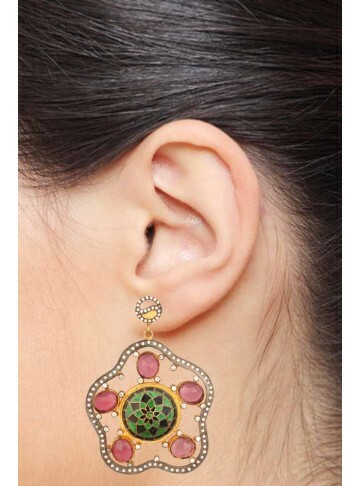 We absolutely love the shape of this earring and the intricately painted lotus design. Perfect to wear this Festive season! If you like earrings that are small yet have the capability to make a statement, these paisley studs are for you. 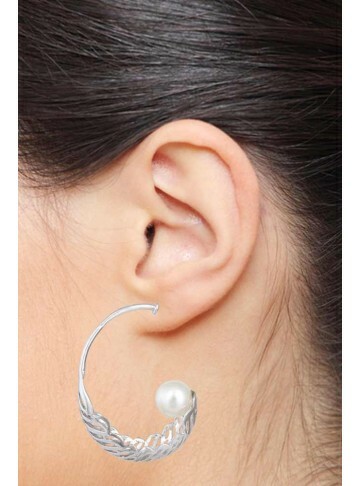 Wear it to a wedding or for a party, your ears will thank you for not wearing something too heavy! Did you know Cleopatra loved wearing Jewellery. One of the most famous queen of ancient Egypt, she definitely had a style of her own. Wear these chand balis from our Egyptian collection and feel like a queen from that era. These gold plated silver earrings are truly unique, it has a front facing and side facing view. 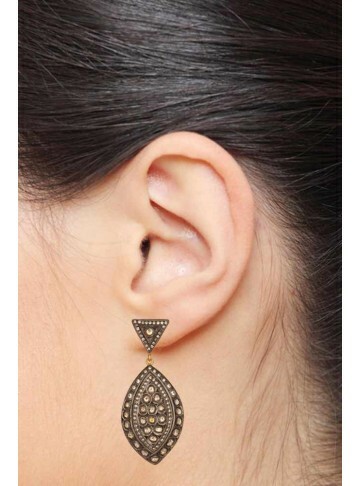 Inspired from Egyptian designs, these earrings are definitely a statement maker! All designs in our collection have been inspired from Ancient Egypt and combined with modern motifs giving it a contemporary appeal. A lovely pair of paisley long earrings with zircons, handmade in silver and gold plated beautifully. This design has been included to give you a different take to our Egyptian collection. A stunning statement earring in gold plated silver with chalcedony and zircon. Perfect for a cocktail dinner! Stylish ear cuffs with zircon and iolite in two tones for a party look. You will fall in love! If you're looking for a one of kind earring, look no more, this rose pink earrings with pearls and bell shaped drops is so unusual, you will love them! Wear them with your favorite black outfit to give yourself that glamorous look! Hammered circles with a center moonstone surrounded by a random arrangement of cubic zirconia. Makes for an eyecatching dangle drop for that special occasion! Painstakingly crafted, each golden petal stands out in these sunflower inspired earrings with a profusion of crystals in the centers. This timeless jewel is a must-have for any lady. Statement Earrings are the best ear dazzlers to draw attention! Our assortment of bold and unique statement earrings are quirky, impactful and distinctive. From earrings with decorative bejewelled blitz to earrings featuring graceful patterns, they make sure you stand out from the rest! The combination of different colours and precious stones and metals like ruby, emerald, pearl, garnet and silver make sure these earrings are incredibly beautiful. 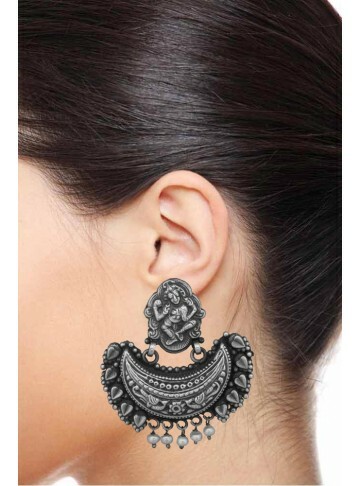 Cleopatra’s Chand Bali, Dancing Temple Bell Enamel Earring, Shiny Golden Tear Drop Shaped Earrings & Cleo style Paisley Studs are just some of the unique and eye-catching sterling silver statement earrings. Buy statement earrings online to demand attention and add the right amount of elegance to your evening attire. 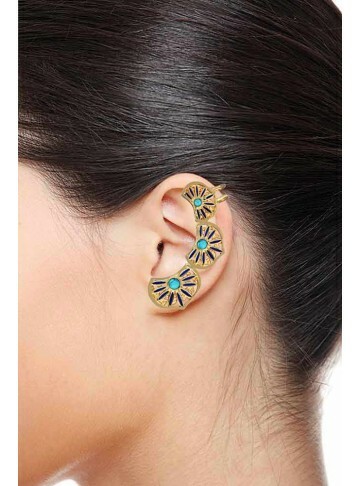 For everyday wear, a pair of statement cuff earrings and hook earrings have just the right amount of attractive detailing that won't overpower your kurtis or favourite tops. Shoulder-grazing danglers and drop earrings are best recommended for special occasions to compliment a saree, Lehenga, palazzo or a gown. Either inspired by vintage designs or having a unique style, they are not your usual statement earrings online. 1. What is a statement earrings? Statement earrings are intentionally large to draw attention to itself and the wearer. It is not necessarily colourful, bright or oversized but it is usually bold and unique. Statement earrings online are something that’s like “so hot right now”, and they also don’t rely on other accessories for support. 2. Why should every girl own at least one statement earrings? Are you a non-dramatic, simple and bold fashion person? Do you think less is more? 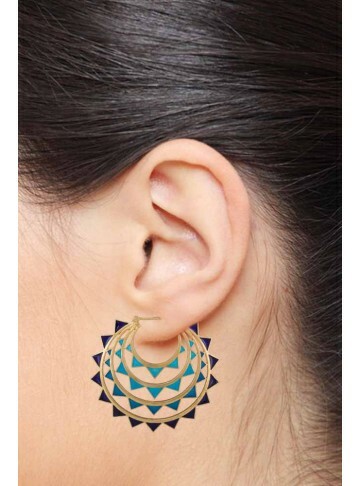 Then statement earrings are looking to get adopted by you and you alone! Statement earrings online are one of your must-haves because just a pair of statement earrings with a simple outfit can instantly deck you up for any occasion. Could you ask for an easier option to uplift your special look? Statement earrings are Big, Bold, Bright and are sure to make you the star of any event. They take you to a whole new level of fashion by being independent. From chunky earrings to ethnic chandbalis, fusion jewellery to contemporary earrings, there is wider variety in our statement jewellery collection. Whether you want silver statement earrings that fit into your budget or more luxurious ones, you’ll find whatever your heart desires.